Business Bank Account Charges in Ireland – a Comparison. If you run a business – as a sole trader or a limited company , you should probably have a business current account with a bank. If your small business doesn’t deal in cash or cheques – just online payments , cards and bank transfers – you might want to consider N26 . This online bank is Free . Some banks will offer a period of fee free banking for new business customers. With BOI, AIB and Ulster this is for 2 years. For larger businesses there will be other charges for things such as making bulk charges by Direct Debit or bulk credits. As we mentioned earlier – N26 is worth looking at if you are a sole trader / freelancer or similar . The account is operated fully online and there are no fees for business accounts . Cash or cheques are not accepted. They have an full EU banking licence and funds are covered by the German bank guarantee. Making or receiving payments in currencies other than Euros is another way that the banks make more money from business accounts. They might say there is no charge for non Euro transactions – but the banks will still make significant amounts of profit from the margin on the exchange rates they use. Some banks will also charge commission and other fees for foreign transactions. For example AIB will charge €6.35 for an incoming Sterling payment over €127. Setting up an overseas bank account to receive funds can be a hassle and involve significant paperwork. 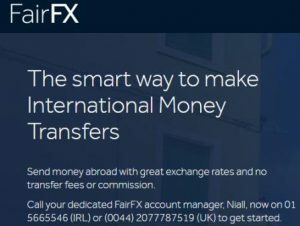 If your business is regularly making or recieving large payments in Sterling , US Dollars or other currencies – you might want to look into using the services of a currency exchange specialist. They can also help your business reduce the risk of currency fluctuations affecting your business profits. More here about Currency Hedging Options for Businesses. You can find our comparison of the charges on personal current accounts in Ireland. Thanks “mr bloggs” – for pointing out the 55c cheque processing fee at Ulster Bank . I have corrected the Ulster Bank figure to take account of this. However – I have double checked the other figures and am satisfied they are correct .